Need volunteering experience? But don’t think you have the time? Think again! MND (motor neurone disease) is a fatal, rapidly progressing disease that affects the brain and spinal cord. It kills a third of people within a year and more than half within two years of diagnosis. It affects up to 5,000 adults in the UK at anyone one time and there is no cure. Volunteers play a huge part supporting people affected by MND, whether that’s by raising vital funds, supporting those in the local community or campaigning for their rights. But we know that as students you already have to juggle a hectic study and social life balance, so committing time to a formalised long-term volunteering role can be difficult, even though it could equip you with the skills and experience to make that CV shine. Our STRONG campaign allows you to do just that. Whether you can volunteer for hours, days or weeks, it all makes a difference to the lives of people affected by MND. In 2 weeks you could tick another thing off your bucket list. All whilst supporting a great cause. Sounds good right? Well you’ll be glad to know there’s no longwinded application process (hurrah!). You simply visit the STRONG website, use the sliders to pledge your time, fill in a couple of details and you’re done! We’ll then be in touch with you soon after to get the ball rolling. 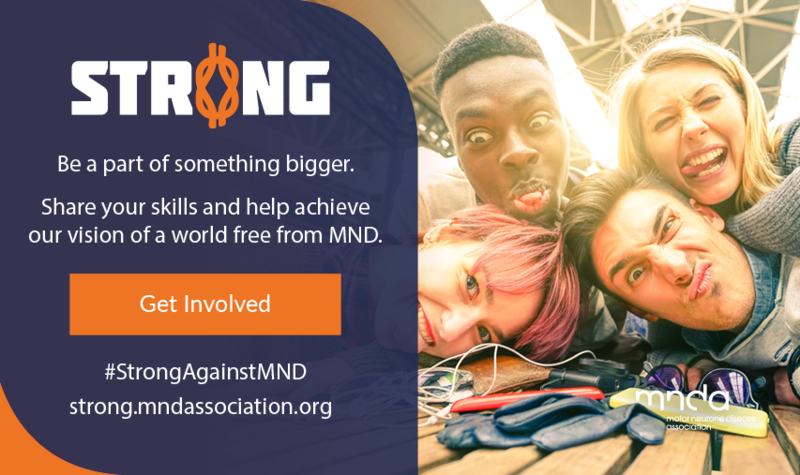 Join us in our efforts to support people with MND, their families and carers and help us move closer towards our vision of a world free from MND.